Spring or Autumn when the city is at its most beautiful and most comfortable for walking in – Not too cold, not too hot! Avoid the midday boat tour in the Summer as the glass boats can become rather warm! 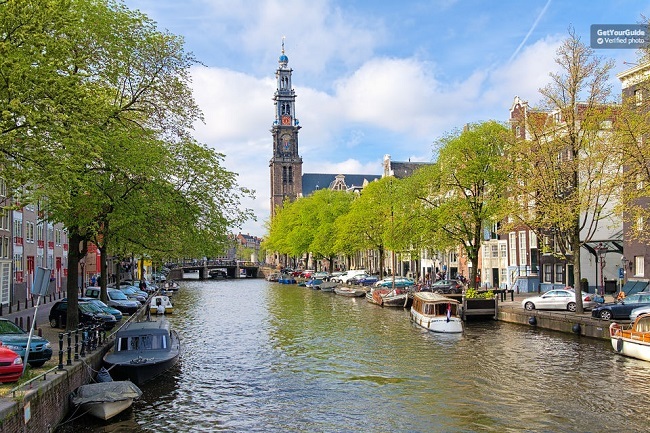 We are comparing Amsterdam Walking Tour and Canal Cruise Prices from leading ticket suppliers and Try to find you Cheap tickets prices on the market. there\'s no better way to discover a city than from a locals perspective. On this walking tour you can learn the history of the city from a local guide who shows you the most popular neighbourhoods and sights as well as those lesser known places that most tourists don\'t know exist. the boat tour allows you to travel along the UNESCO World Heritage Protected canals, admiring the 16th and 17th architecture of the grand houses that line the canal banks, floating beneath the picturesque bridges, and seeing more of Amsterdam\'s top attractions and monuments. the boat is enclosed and has large glass windows allowing panoramic views and a glass roof that is closed in winter to keep you toasty warm and opened in summer to allow extra photo opportunities as you point your camera to the sky. A great way to discover Amsterdam, and learn its history both from the street And from the water ensuring you don\'t miss out on either aspect. Ideal for people who love sightseeing with a guide, learning facts, hearing fictional stories, and getting all their questions answered. A good way to feel assured that you\'ve seen Amsterdam if you only have a short amount of time. there\'s 5 km / 3 miles of walking involved at a fairly leisurely pace so make sure you\'re able to do this. Your Experience With Amsterdam Walking Tour and Canal Cruise? You\'ll meet your friendly and knowledgeable multilingual guide either at your hotel or at a central meeting point and from there your walk will begin as you see Amsterdam like never before, from the eyes of a local. You\'ll be shown some of the top attractions and districts in the city including the museum quarter, Dam Square, West Church and plenty more but you\'ll also be shown the hidden places in the city that only your guide and other locals know about. Along the way you\'ll learn the history of the city, some lesser known facts and some well known facts but all delivered in a fun and informative way, you won\'t be left bored or bombarded with facts and figures! You\'re free to ask as many questions as you can think of and can even get tips on where to eat and what to see during the rest of your stay in Amsterdam. If you take the tour with Viator you\'ll be able to enjoy a little food tasting as well with some cheese and stroopwafel. After the walking tour your guide will leave you at the boat dock where you can board the glass-enclosed barge and see Amsterdam from the water. Onboard you\'ll have either audio commentary through headphones or a live guide, depending on which booking site you use. What Amsterdam Walking Tour and Canal Cruise Includes? Guided walking tour with professional multilingual guide. Viator bookings include food tastings on the walking tour, tea/coffee on the boat, and a free gift. Check each booking site carefully – Viator offers \'extras\' which you may or may not want, reflected in the higher price. Travelers Reviews about Amsterdam Walking Tour and Canal Cruise? Travellers talking about this combi tour on GetYourGuide and Trip Advisor give it, for the most part, very positive reviews. Everyone agrees they learned a lot of valuable information from the friendly guide on the walking tour and were kept engaged throughout and left feeling as though they had really discovered the city from a locals perspective that would have been near impossible on there own. People also greatly enjoyed the canal tour too feeling that this rounded the day off very nicely but agreed that the walking tour had the edge simply because it was more personable. Not suitable for disabled visitors. Paper ticket and e-tickets are accepted. Wear comfy shoes and leave heavy bags at your hotel – there\'s a lot of walking! When booking with Viator you must let the agent know what time you want to take the boat tour so that they can book it for you. Meeting point varies depending on booking company – Check your email confirmation for details.